Takoma Village is the first urban cohousing community in the greater metro Washington, DC, area. We have ~90 residents with ~70 adults and 20 children. Those numbers vary but not far from that range. 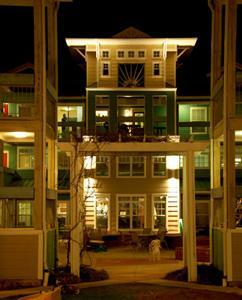 We have forty-three attached condominium units that include flats, duplexes, and townhouses, plus the common house. Units range from one bedroom with a den to four bedrooms with a full basement. The common house includes two guest rooms, children's room, game room, office, living room, laundry room, exercise room, dining room, large kitchen, and workshop. We are located one and a half blocks from the Takoma Metro Station (the Red Line) and within easy walking distance of shopping and restaurants on Georgia Avenue in DC and in Old Town Takoma Park in Maryland. Most residents commute by public transportation or bicycle. Many work at home full or part time. On the Metro, we are 5 minutes from Union Station, 15 minutes from the center of the Mall, and 5 minutes from Silver Spring. Residents range in age from just born to 90 and are well distributed across that range. We have many energy-efficient systems and green materials. All units received the Energy Star rating. All have ground-source geothermal heating and cooling. We installed solar panels in 2015 that serve all common electrical uses and give back energy to the grid. We maintain a notification list and occasionally have units for sale. We rarely have rooms for rent. Sales are at market rate. If you are interested in living in or visiting our community, please contact us. We are always delighted to meet new friends.